If you have updated your touch/slate device to Windows 8.1 Update you will have noticed that the Search button has appeared on your start menu but not the power button. 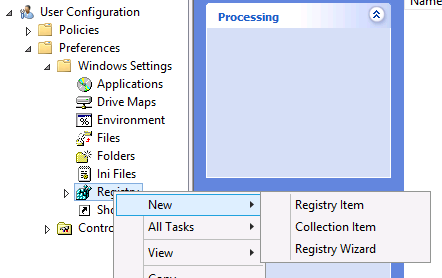 If you were wondering how to enable this button then unfortunately there is no easy way to do this as it is dictated by the type of hardware that you are running the device on (see http://blogs.technet.com/b/askds/archive/2014/04/07/options-for-managing-go-to-desktop-or-start-after-sign-in-in-windows-8-1.aspx ). Meaning if your device is a classified as a touch “slate” device then the Power Button will not be visible. 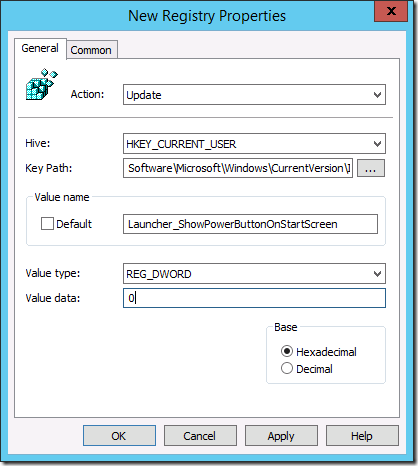 As this is as simple as a registry key then you can easily implemented it as a Group Policy Preferences Registry Extension setting. 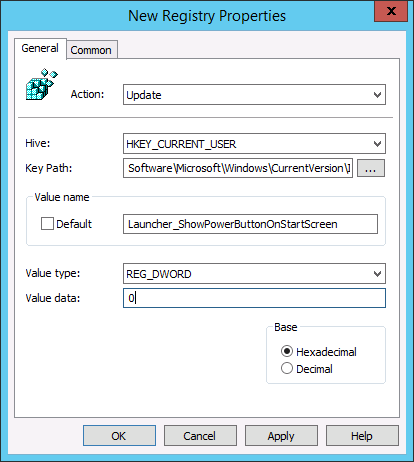 Then type in “Software\Microsoft\Windows\CurrentVersion\ImmersiveShell\Launcher\” into the Key Path field and “Launcher_ShowPowerButtonOnStartScreen” into the Value Name box. 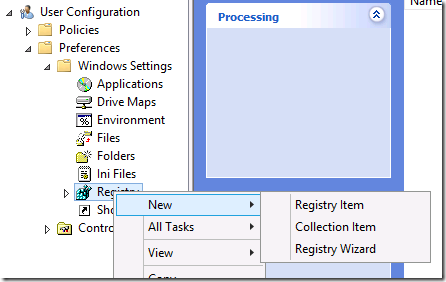 After that Select REG_DWORD and value “1” (enable) or “0” (disable) to configured the power button. Once done you need to wait for a Group Policy Update and then the user to log off and back on for the power button to appear or disappear.